I’m a huge fan of side by side tastings. Personally I feel I’m able to better understand the nuances of a region, grape, producer and vintage. 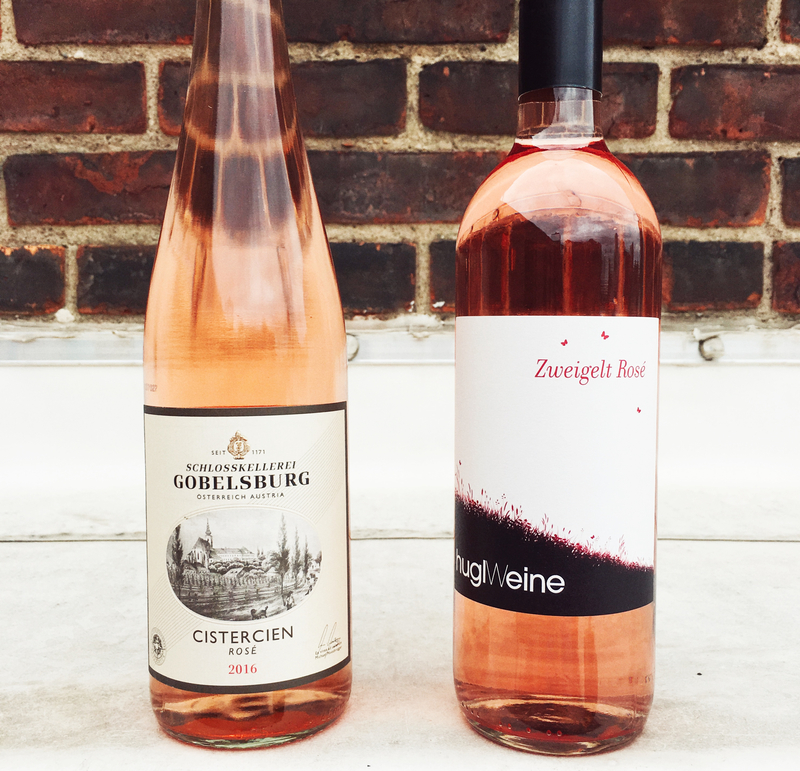 Below are two 2016 Rosés hailing from Austria, one 100% Zweigelt coming from a vineyard that dates back nearly 1000 years, the other a Zweigelt blend from a young winemaking couple that combined their family’s vineyards in 2013. Estate: One of Austria’s oldest wineries, since 1137 the monks of the Zwettl Monastery produced wine at Schloss Gobelsburg. In 1995 Willi Bründlmayer and Michael Moosbrugger took over the historical 35 hectare estate with a long term lease. In 2006 Michael Moosbrugger was awarded ‘Winemaker of the Year’ by the Austrian magazine Falstaff, the highest award given to an Austrian winemaker, and in 2009 and 2010 the estate was acknowledged as ‘ONE OF THE TOP 100 WINERIES OF THE YEAR’ by Wine & Spirits Magazine. Winemaking: Certified sustainable, the estate utilizes organic and sustainable methods in both the vineyards and cellar. Schlosskellerei Gobelsburg is the “classics” line of the estate, the label is a lithography from around 1840 depicting the castle and church on the property. Tasting Notes: Copper pink in colour with friendly aromas of sweet, fresh fruit, white flowers and minerals. Light and fresh with strawberry, raspberry and nectarine flavours underscored by tingly acidity. Citrus zest comprises the refreshing finish. Well balanced, refined, yet with a laid-back edge, a fantastic summery sip. Estate: Weingut Hugl’s vineyards are located on south and southwest facing hillsides within a 2 km (1.2 mi) radius around the town of Poysdor in northeast Austria. The young husband and wife team of Sylvia and Martin Hugl were each raised in winegrowing families. In 2013, they combined their 2 family estates for a total of 22 hectares [54.3 acres] and launched the Hugl-Wimmer line of wines. They also collaborated with several winegrowing partners, increasing their vineyard access by 25 hectares [61.8 acres]. Winemaking: Grapes are sourced from vines 10-15 years old, fermented in stainless steel tanks. Tasting Notes: Pale coral pink in colour with intriguing aromas of wild berries, bramble, white pepper, minerals and a shake of funk. A spicy edge to the tart red fruits [think raspberry, red currant, pomegranate], white pepper and a hint of earthy minerality. Finishing zippy with pepper dusted fruit. Rustic with a bit more intensity then the typical rosé.